Researchers from the Max Planck Institute have discovered a new link between processes associated with a Parkinson’s-related gene defect, paving the way to the development of more refined GDNF therapies in the future. Neurodegenerative diseases like Parkinson’s disease involve the death of thousands of neurons in the brain. Nerve growth factors produced by the body, such as GDNF, promote the survival of the neurons; however, clinical tests with GDNF have not yielded in any clear improvements. Scientists from the Max Planck Institute of Neurobiology in Martinsried and their colleagues have now succeeded in demonstrating that GDNF and its receptor Ret also promote the survival of mitochondria, the power plants of the cell. By activating the Ret receptor, the scientists were able to prevent in flies and human cell cultures the degeneration of mitochondria, which is caused by a gene defect related to Parkinson’s disease. This important new link could lead to the development of more refined GDNF therapies in the future. In his “Essay on the Shaking Palsy” of 1817, James Parkinson provided the first description of a disease that today affects almost 280,000 people in Germany. The most conspicuous symptom of Parkinson’s disease is a slow tremor, which is usually accompanied by an increasing lack of mobility and movement in the entire body. These symptoms are visible manifestations of a dramatic change that takes place in the brain: the death of large numbers of neurons in the Substantia nigra of the midbrain. Despite almost 200 years of research into Parkinson’s, its causes have not yet been fully explained. It appears to be certain that, in addition to environmental factors, genetic mutations also play a role in the emergence of the disease. A series of genes is now associated with Parkinson’s disease. One of these is PINK1, whose mutation causes mitochondrial dysfunction. Mitochondria are a cell’s power plants and without them, a cell cannot function properly or regenerate. Scientists from the Max Planck Institute of Neurobiology and their colleagues from Munich and Martinsried have now discovered a hitherto unknown link that counteracts mitochondrial dysfunction in the case of a PINK1 mutation. The PINK1 gene emerged at a very early stage in evolutionary history and exists in a similar form for example in humans, mice and flies. 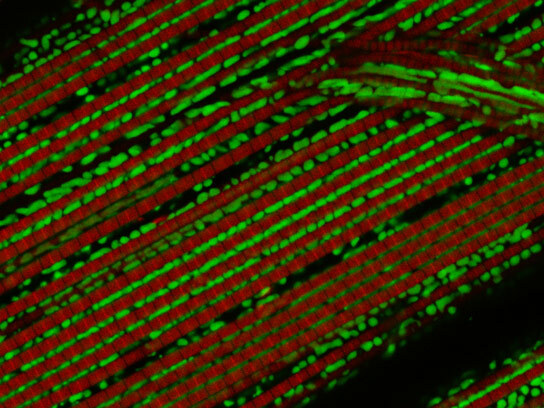 In the fruit fly Drosophila, a mitochondrial defect triggered by a PINK1 mutation manifests in the fraying of the muscles. Less visible, the flies’ neurons also die. The scientists studied the molecular processes involved in these changes and discovered that the activation of the Ret receptor counteracts the muscle degeneration. “This is a really interesting finding which links the mitochondrial degeneration in Parkinson’s disease with nerve growth factors,” reports Rüdiger Klein, the head of the research study. Ret is not an unknown factor for the Martinsried-based neurobiologists: “We already succeeded in demonstrating a few years ago in mice that neurons without the Ret receptor die prematurely and in greater numbers with increasing age,” says Klein. The Ret receptor is the cells’ docking site for the growth factor GDNF, which is produced by the body. Various studies carried out in previous years showed that the binding of GDNF to its Ret receptor can prevent the early death of neurons in the Substantia nigra. However, clinical studies on the influence of GDNF on the progression of Parkinson’s in patients did not lead to any clear improvement in their condition. The new findings from basic research suggest that the mitochondrial metabolism is boosted or re-established through Ret/GNDF. “Based on this finding, existing therapies could be refined or tailored to specific patient groups,” hopes Pontus Klein, who conducted the study within the framework of his doctoral thesis. This hope does not appear to be completely unfounded: The scientists have already discovered a Ret/GDNF effect in human cells with a PINK1 defect similar to that observed in the fruit fly. It may therefore be possible to search for metabolic defects in the mitochondria of Parkinson’s patients in future. A specially tailored GDNF therapy could then provide a new therapeutic approach for patients who test positively. 1 Comment on "Researchers Discover New Link between Processes Associated with a Parkinson’s Related Gene Defect"
Mitochondrial route to treat Parkinson`s is an ideal one. Let us hope that one day a cure will be found to alter the architecture of the cell and avoid its disintegration. thank You.